Adventure. Daring. Fighting. War. Courage! 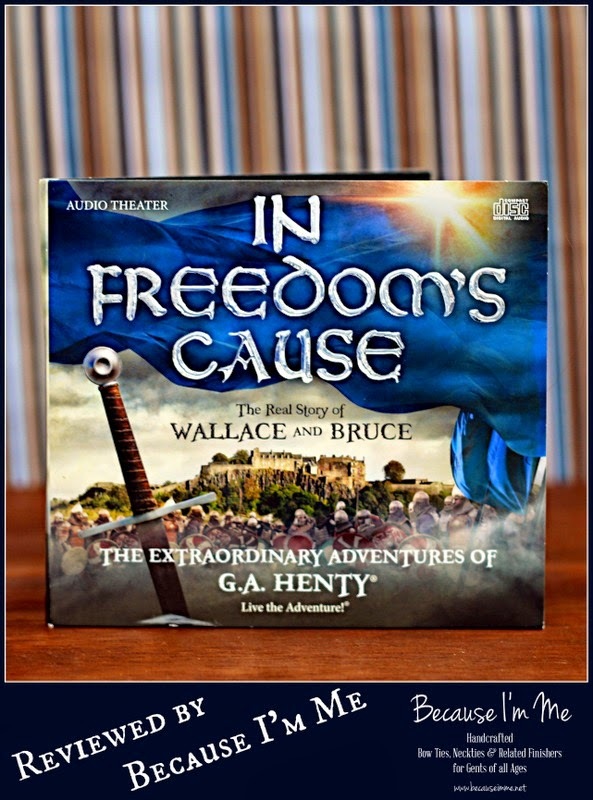 Recently, I was given a copy of Heirloom Audio Productions 2 CD Collection In Freedom's Cause's - The Real Story of Wallace and Bruce, The Extraordinary Adventures of G.A. Henty to review with the boys, Adam (13), Kaden (11), and River (6). G.A. Henty was a novelist and war correspondent who wrote epic adventures that took place within the settings of important periods in history. Henty did extensive research for his books and was able to blend very detailed and accurate accounts of history into his stories, giving the reader a broader understanding of a time period than a history book might. The main characters of his children's novels were intelligent, brave, honest and resourceful, yet also modest, traits we work to instill in our children today. 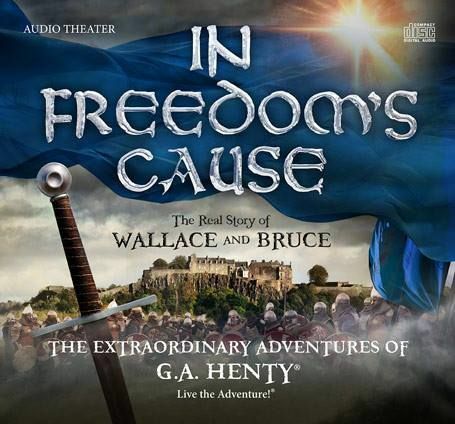 Henty wrote the book this audio CD is based on, In Freedom's Cause - A Story of Wallace and Bruce, in 1885. In a nutshell, Heirloom Audio Productions took Henty's book and adapted it into audio theater, doing quite a bit of research of their own along the way, even going so far as to travel to Scotland to get a feel for the surroundings of the story. They then found very talented actors to portray the characters, such as Joanne Froggatt of Downton Abbey, Billy Boyd of Lord of the Rings, Skandar Keynes of Chronicles of Narnia, and James Cosmo of Braveheart. In the end, they created a remarkable 2 1/2 hour adventure. Of course, we all know who Wallace and Bruce were, right? Not a clue in this house. The Wars of Scottish Independence? Not that either. It's not that we don't study history, I promise we do, we just haven't studied that particular history. The story is told, mostly, from the point of view of Ned, an English school boy, raised by his mother who has a strong faith in God, and is set at the turn of the 14th century. As a young man Ned learned that his father had died at the hand's of another man who took Ned's family castle and land. That, combined with the fact that he was an enthusiastic and adventurous young man, led him to learn to fight and eventually become passionately involved in the Scottish uprising and fight for independence against the English. Throughout the story we learn how he met his wife (she was climbing a tree), how he learned to fight well, become involved with William Wallace, learned to make very strategic decisions through the example of Wallace, became a leader, and how he met and became associated with Robert the Bruce. Through the first portion of the drama we learn about William Wallace, who was born in 1270 (and was the subject of Braveheart). Wallace led the charge for Scottish Independence and was a brave, intelligent, charismatic man. 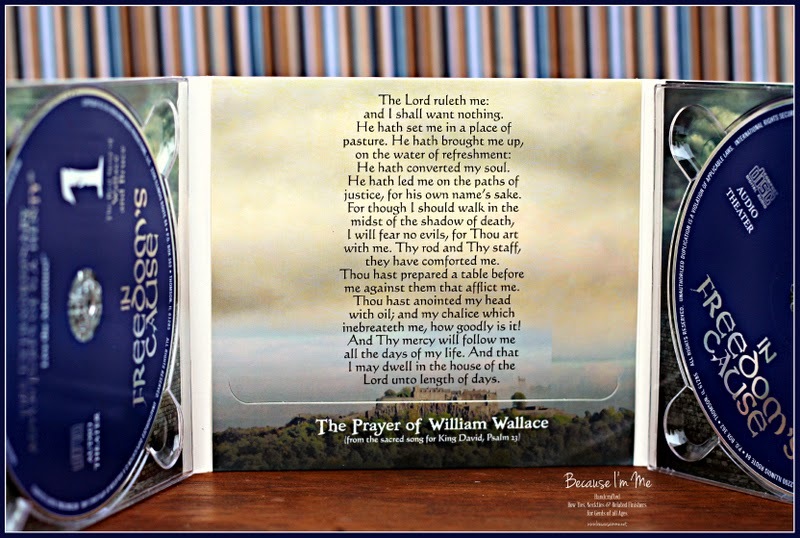 Wallace had a strong faith and was known to read the Psalms regularly. In fact, his courage at his death motivated his followers and fellow countrymen to remain brave and continue the fight for freedom from England, rather than give up as the king had expected them to do after losing their leader. The story then shifts to Robert The Bruce and his continuation of the fight against the English. When we first met The Bruce he was on the side of the English, then he switched to the side of the Scottish, then back to English, and finally back to Scottish Over time he became much more convicted in his view of the importance of independence. The Bruce used the skills he'd learned from Wallace to win Scotland's freedom. He became King of Scotland in 1307 and ruled until his death. Obviously, that's a quick summary of the story. If I were to tell you the whole thing you wouldn't be on the edge of your seat when you listened to the CD's, would you? We opted to listen to the two CD's in the car. I really enjoyed the program. The acting is terrific as are the background sounds and music. In one early scene Ned is training for the uprising with local youths, using an outbuilding they discovered in the woods. I felt as if we were there with him and found myself holding my breath worrying that something would go wrong and they'd be discovered by the English (they weren't). Thanks to quality writing, acting, and production, I could feel and understand the emotions of the characters. Accompanying the audio theater CD's is the full-color downloadable study guide for In Freedom's Cause, The Real Story of Wallace and Bruce. The majority of the 50 page study guide is devoted to sets of questions, each covering a few minutes of the audio drama. Each page contains the "Listening Well", questions about what has happened in the story, the "Thinking Further" section, open ended questions giving the user a chance to think and explore a little further, and "Defining Words", words to look up and learn the meanings to. At the end of the study guide is a section with a bit of history of Scotland before the story begins and a section of Bible study questions. In Freedom's Cause is geared towards kids ages 6 and up and the study guide is very helpful, especially the "Listening Well" section for young readers who may have a more challenging time following the story. The boys liked this. They liked the story and the action. The story was easy for River to follow, but I think grasping the real magnitude of what these battles meant was over his head. The other boys, and I, learned about something we knew nothing about and about people we knew very little about, especially their lives at that time in history. In Freedom's Cause is available for purchase through Heirloom Productions. In Freedom's Cause can be found on Facebook and on Pinterest. Click the image below to see what other reviewers thought of this program.